Birthday cards seem to be the cards I need most often, so I like to keep a variety on hand. Today’s card is an easy (less than 10 minute) card for the Song of My Heart Christmas party Shoe Box Swap. If you’re not familiar with shoe box swaps, basically each person who is attending designs a card and cuts a set of all the pieces for each person who is attending and puts them in a shoebox or other container. Then they add the stamp set, any ribbon, embellishments, a glass block, punches, ink pads, etc. to the box so that everyone else can recreate the card that they designed. We go around the room, making each of the cards, with a break for fun and food about halfway through the process. Since we have about 20 people attending, that’s quite a bit of stamping! 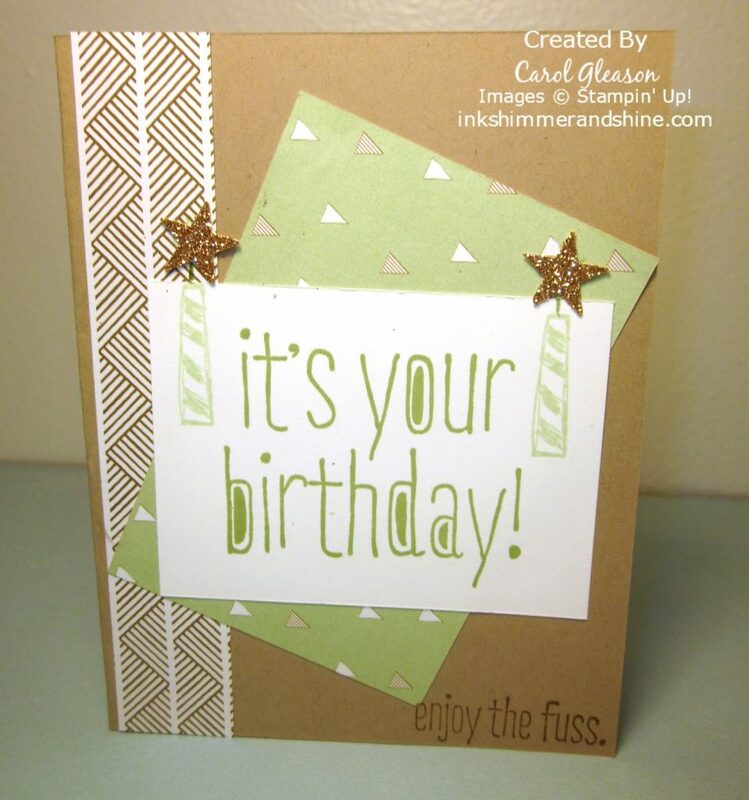 The Designer Series Paper (dsp) is from the Stampin’ Up! Lullaby pack. There are some great patterns in the set that can be used not only for baby cards, but for many other occasions too. I thought that the baked brown sugar and pistachio pudding patterns worked well for a more masculine birthday card. Start by cutting your 5-1/2 x 8-1/2 card base from Crumb Cake card stock and folding in half. Then cut a 1″ x 5-1/2″ strip of the brown sugar Lullaby dsp, a 3-3/8″ x 2-1/2″ piece of whisper white card stock, and a 4″ x 2-3/4″ piece of pistachio pudding Lullaby dsp. Stamp the birthday sentiment from the Big News stamp set in Wild Wasabi ink on the whisper white card stock, then attach the pieces. Next, stamp the candle twice in Pistachio Pudding ink. If desired, you can use the Wild Wasabi Stampin’ Write Marker to darken the wick a little, especially on the dsp. Punch two stars from gold glimmer paper and attach with a glue dot at the top of the stamped wick. Lastly, stamp ‘Enjoy the fuss’ in the lower right corner in Baked Brown Sugar ink. Quick and easy! Just what this season of holiday busyness calls for. Visit my online store to purchase these or many other great Stampin’ Up! products. As always, the clearance rack items are in the rotating display on the right panel of my page, so check there for great stocking stuffers! Big News, Lullaby, masculine, punches. Bookmark.